The latest update from NASA's Kepler space telescope — designed to spot distant exoplanets — adds more than 500 new possible planets to the fray. That's in addition to the 4,175 planets already found by Kepler. And of those 500 new potential planets, scientists say, a dozen could be remarkably Earth-like. That means they're less than twice as large as Earth, are potentially rocky and are at the right distance from their host stars to harbor liquid water. Of that dozen, one planet has been confirmed: Kepler 452b, which sits 1,400 light years away from us and orbits a star much like our own — at the same distance as Earth orbits our sun. 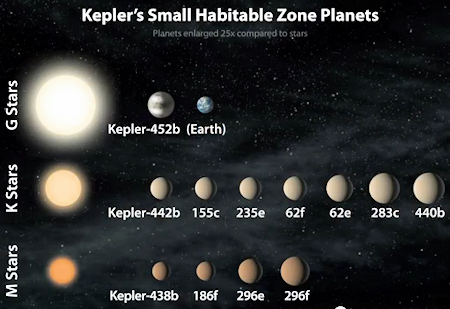 It has a "better-than-even chance" of being a rocky planet (like Earth), according to statements from Kepler scientists. We can't know for sure what the mass of Kepler 452b is, but models suggest that it might be as much as five times as massive as Earth, with gravity twice as strong. A rocky planet that massive would likely have volcanic activity. . . .